This is super easy, guys. Preheat your oven to 400. Put all of your ingredients in a large mixing bowl and mash them all together until they’re really well combined. Line a baking sheet with foil and spray with a nonstick cooking spray (or brush with canola oil) to prevent too much sticking. 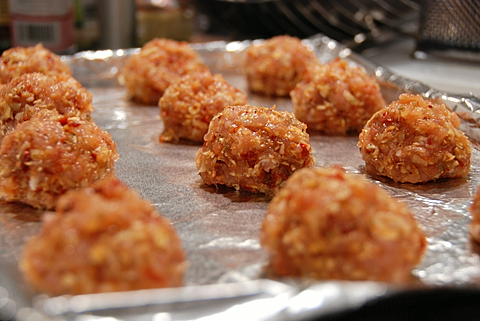 Then form the meatball mixture into balls and place on the baking sheet. They don’t really spread much so you don’t need to worry about that. 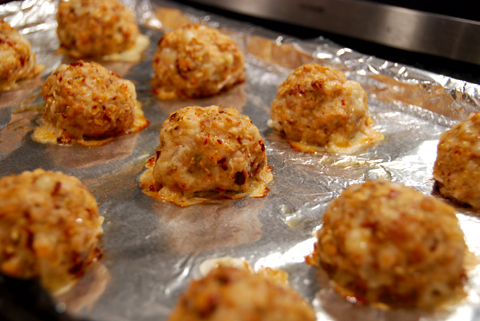 Bake them for 15-20 minutes, or until they’re cooked through and slightly browned. Cook the pasta until al dente. 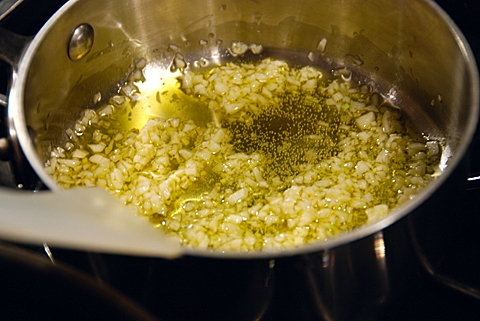 Meanwhile, add the olive oil to a small pan, and when it’s heated, add the garlic. Cook until lightly golden, 10-15 minutes or so. 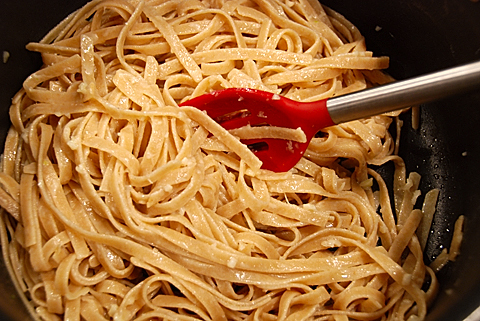 When the pasta is finished, drain and return it to the pot; add the garlic and olive oil and toss well. 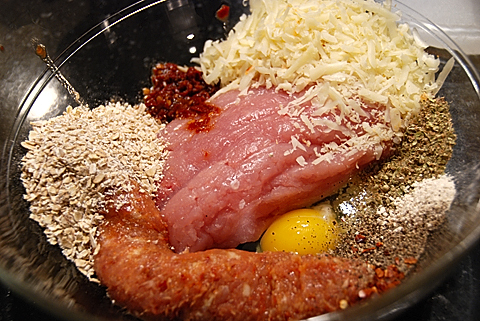 Add the Parmesan as well and mix again. Add more olive oil if it’s needed to coat the pasta sufficiently. Also, I should mention that we decided we needed some kind of vegetable to go with this meal, so we made a quick side that is fantastic and super easy: chop up some almonds, chop up some garlic (one or two cloves is usually sufficient), and prep some green beans. Put a little oil in a pan and let it heat up; toss in your garlic and sautée it for a minute or so, then add the almonds and let them toast for a couple of minutes. 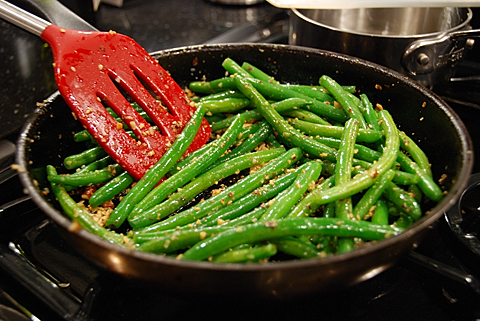 Finally, add in your green beans and sautée until bright green and still snappy. Throw them all together on a plate (…or, I mean, eat out of the pots and pans, but we do pretend to be civilized here…) and enjoy! I’m glad you liked the idea for the recipe! Yours looks fabulous! 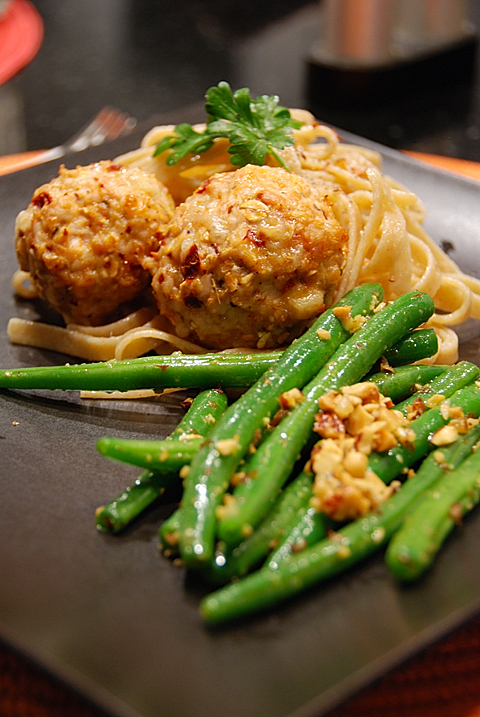 You are currently reading Garlic Pasta + Spicy Meatballs + Green Beans at Nombudsman.